A NYPD detective slashed by a man with a meat cleaver revealed harrowing new details about the attack near Penn Station – and how a “hero” officer saved his life. "I’m grateful. For some reason I was saved. I don’t know why," Detective Brian O’Donnell told NBC 4 New York in an exclusive interview, his first since the Sept. 15 attack in which the entire side of his face was cut. O’Donnell was off duty when he jumped into action, tackling a suspect who was being chased by uniformed officers – with guns drawn – amid the rush hour crowds. "I'm thinking robbery, murder, something like that because it’s not very often we see uniformed officers in New York running with their gun in their hands chasing one guy," said O’Donnell. A NYPD detective slashed by a man with a meat cleaver revealed harrowing new details about the attack near Penn Station – and how a “hero” officer saved his life. Jonathan Dienst reports. In fact, the suspect, Akrahm Joudeh, got upset when a boot was placed on his illegally park car – and he allegedly pulled out a meat cleaver. "I didn’t think I was going to get hurt," O'Donnell said, recalling his split-second decision. "Simply knock the guy down and take him to the ground, keep going, get my train home – no big deal." But O'Donnell said Joudeh hit him twice with the cleaver, severing arteries in his face and narrowly missing his eye. Officers shot Joudeh seconds later – as the detective stood just feet away. "Terrifyingly close, put it that way," he said. Still, O’Donnell didn’t know he was seriously injured until another officer came over to help him. "I started talking to him and I said, '1-out-10, how bad?' And he said, '11.' I knew," O'Donnell said. "I could tell by the reactions it was bad. I didn’t know I wouldn’t have this kind of damage. I obviously couldn’t see it, but I knew it was bad." The off-duty detective who was gashed from his temple to his jaw when he tackled a man fleeing police with an 11-inch cleaver in a chaotic attack near Penn Station at the height of Thursday's evening rush left the hospital Friday afternoon. Jonathan Dienst Reports. Detective Dennis Canale, who responded to the scene with other NYPD Emergency Services officers, instantly knew O’Donnell was in trouble. "It was an absolutely devastating injury," Canale told NBC 4 New York. "If the bleeding had not been controlled there within several minutes, he would have passed away." 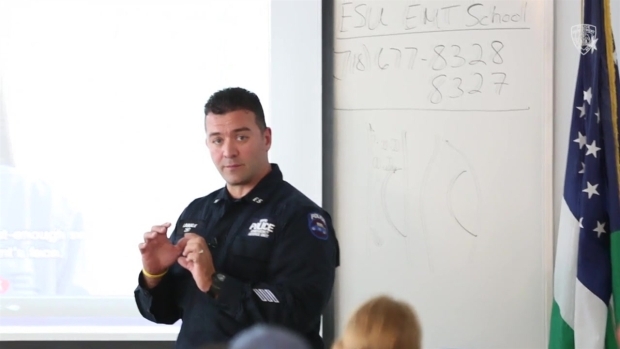 While all ESU officers are trained as emergency medical technicians, Canale is also a physician’s assistant who has worked part-time in a hospital for 13 years. He quickly began treating O’Donnell. "I promised him I wouldn’t leave his side," said Canale, describing how he treated the wound and pressed his fingers directly on severed arteries in O’Donnell’s face to slow the bleeding. "He never took his fingers off my face. In the ambulance, fingers in my face the whole time," said O’Donnell of the ride from Penn Station to Bellevue Hospital. "That’s my hero." Canale shrugged off the praise, and gave it back to O’Donnell. Surveillance video obtained exclusively by NBC 4 New York shows the chaos and panic near Penn Station at the height of rush hour Thursday when a cleaver-wielding suspect ran through the street being chased by police. Marc Santia reports. "He’s a hero," Canale said. "He put everything aside. He was off duty, heading home. No regard for himself. He just jumped in and tackled him." 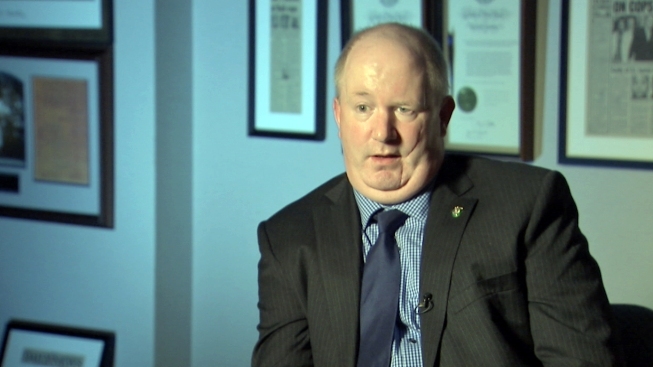 O'Donnell, who plans to return to work in January, told NBC 4 New York he would expect the same of any officer, on duty or off. "I'd still do it again," he said. "I didn’t expect to get hurt. I had no intention of getting hurt. I survived it but I would do it again."